Carbohydrates (or, as they are known colloquially, carbs) have experienced a tumultuous few decades in American culinary culture. Remember the food pyramid, which advised that we consume six to eleven servings of carbohydrates—in the form of bread, cereal, rice, and pasta—per day? Nowadays, we're inundated with no-carb or low-carb diets; still, carbohydrates make up most of the food and drink that continues to fill our refrigerators and cupboards. Whether or not this is healthy is debatable, as research on food choices continues. What is certain, however, is that carbohydrates are the most direct source of chemical energy for almost all organisms, ranging from single-celled protozoa to more complex organisms, such as plants and animals—including people. From a molecular standpoint, carbohydrates used to be defined by the empirical formula Cn(H2O)n, but this definition is now considered antiquated. This formula only applies to simple monomeric sugars, which are also called monosaccharides. As simple sugars link to form complex sugars, water loss occurs, thus changing the empirical formula to Cn(H2O)m for complex sugars. In this chapter, we'll discuss how the various types of carbohydrates we utilize for metabolism are classified, the structures in which they exist, and the biochemical reactions they undergo. Carbohydrates come in many types. They can be classified by the number of sugar moieties that make them up, the number of carbons in each sugar, the functional groups present on the molecule, and the stereochemistry of the sugar. 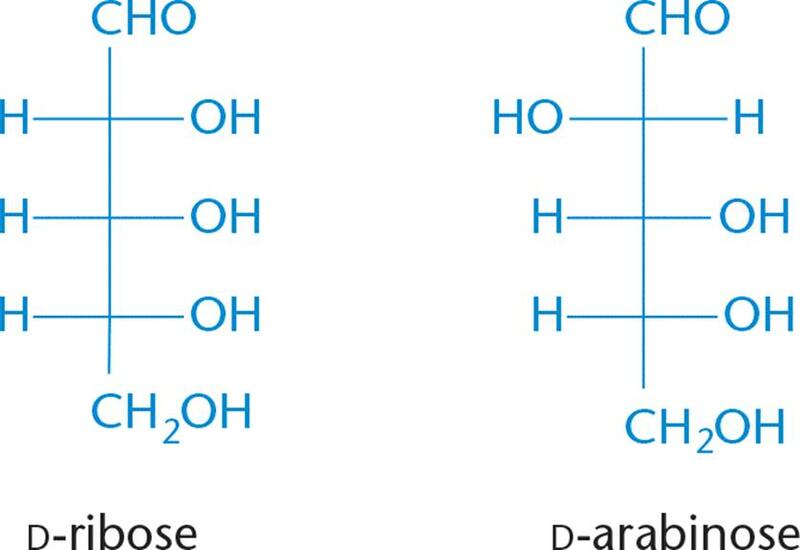 Whenever we discuss carbohydrates (or anything else in biology), it makes sense to start with the most basic structural units, which are monosaccharides. The simplest monosaccharides contain three carbon atoms and are called trioses. Carbohydrates with four, five, and six carbon atoms are called tetroses, pentoses, and hexoses, respectively. Carbohydrates that contain an aldehyde group as their most oxidized functional group are called aldoses and those with a ketone group as their most oxidized functional group are called ketoses. Taken together, a six-carbon sugar with an aldehyde group is called an aldohexose, while a five-carbon sugar with a ketone group is called a ketopentose. The basic structure of a monosaccharide is illustrated by the simple sugar glyceraldehyde, which is an aldose as shown in Figure 4.1. Figure 4.1. Glyceraldehyde The simplest aldose (an aldotriose). The MCAT likes to present complex, novel molecules and then test you on the most basic information about them. Therefore, when dealing with carbohydrates on the exam, look for the functional groups we have seen before (aldehydes, ketones, and alcohols) and realize that they retain the same chemical properties that you already know. Glyceraldehyde is a polyhydroxylated aldehyde, or as described above, an aldose (aldehyde sugar). The numbering of carbon atoms in a monosaccharide follows the rules described in Chapter 1 of MCAT Organic Chemistry Review. The carbonyl carbon is the most oxidized, and therefore will always have the lowest possible number. In an aldose, the aldehyde carbon will always be carbon number one (C-1). The aldehyde carbon can participate in glycosidic linkages; sugars acting as substituents via this linkage are called glycosyl residues. The simplest ketone sugar (ketose) is dihydroxyacetone, shown in Figure 4.2. Again, the carbonyl carbon is the most oxidized; in this case, the lowest number it can be assigned is carbon number two (C-2). This is true, in fact, for most ketoses on the MCAT: the carbonyl carbon is C-2. Ketoses can also participate in glycosidic bonds at this carbon. Notice that on every monosaccharide, every carbon other than the carbonyl carbon will carry a hydroxyl group. Figure 4.2. Dihydroxyacetone The simplest ketose (a ketotriose). On the MCAT, a few sugars are tested by referencing their common names, or names that do not necessarily follow the nomenclature rules listed above. You should be familiar with the names of the important monosaccharides listed in Figure 4.3. Optical isomers, also called stereoisomers, are compounds that have the same chemical formula; these molecules differ from one another only in terms of the spatial arrangement of their component atoms. A special type of isomerism exists between stereoisomers that are nonidentical, nonsuperimposable mirror images of each other. These molecules are called enantiomers. A chiral carbon atom is one that has four different groups attached to it; any molecule that contains chiral carbons and no internal planes of symmetry has an enantiomer. Isomerism is discussed in detail in Chapter 2 of MCAT Organic Chemistry Review. The isomerism seen in carbohydrates is just an extension of that conversation; many sugars are related to each other as enantiomers or diastereomers. where n is the number of chiral carbons in the molecule. The two systems for naming chiral carbons are not interchangeable! While some D-isomers are equivalent with (R), others are (S). When dealing with biomolecules like sugars, anticipate using the biochemists' method of nomenclature: D and L.
When trying to figure out how many possible stereoisomers can exist for a multi-carbon compound, identify the number of chiral carbons (n) and plug into the formula 2n. For example, 21 = 2 stereoisomers and 22 = 4 stereoisomers. Early in the twentieth century, scientists used glyceraldehyde to learn about the optical rotation of sugars. The results of this early study led to the D and L naming convention. D-Glyceraldehyde was later determined to exhibit a positive rotation (designated as D-(+)-glyceraldehyde), and L-glyceraldehyde a negative rotation (designated as L-(–)-glyceraldehyde). Note that the direction of rotation, (+) or (–), must be determined experimentally and cannot be determined from the D or L designation for the sugar. D and L are based on the stereochemistry of glyceraldehyde. These are NOT related to the (+) and (–) designations denoting optical rotation. On the MCAT, all monosaccharides are assigned the D or L configuration based on their relationship to glyceraldehyde. The Fischer projection is a simple two-dimensional drawing of stereoisomers. Recall that in a Fischer projection, the horizontal lines are wedges (out of the page), while vertical lines are dashes (into the page), as shown in Figure 4.5. Figure 4.5. Fisher Projection Horizontal lines are wedges (out of the page); vertical lines are dashes (into the page). Fischer projections allow scientists to identify different enantiomers. Using this system of structural representation, all D-sugars have the hydroxide of their highest- numbered chiral center on the right, and all L-sugars have that hydroxide on the left. 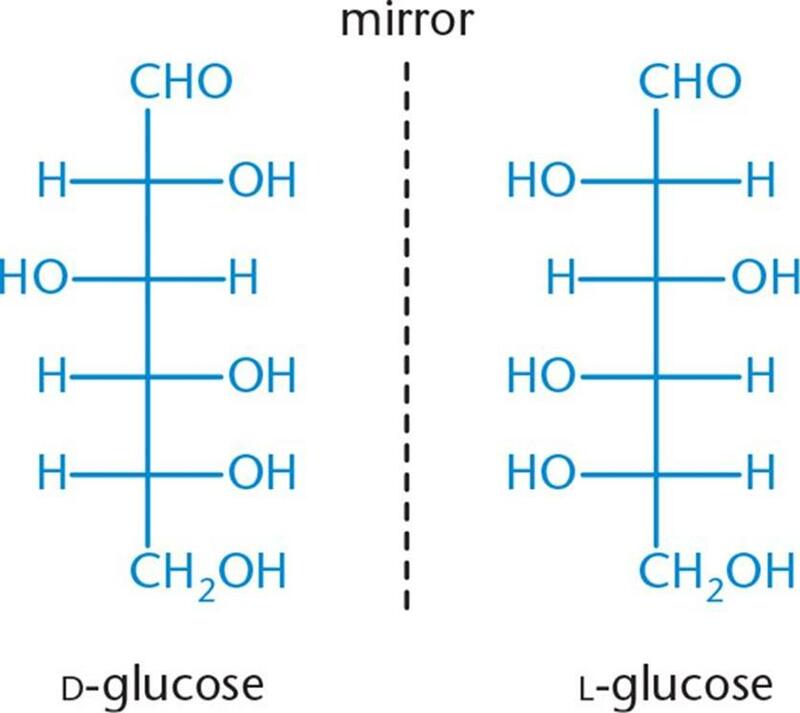 Because D-glucose and L-glucose are enantiomers, this means that every chiral center in D-glucose has the opposite configuration of L-glucose, as shown in Figure 4.6. 1. The same sugars, in different optical families, are enantiomers (such as D-glucose and L-glucose). 2. Two sugars that are in the same family (both are either ketoses or aldoses, and have the same number of carbons) that are not identical and are not mirror images of each other are diastereomers. 3. A special subtype of diastereomers are those that differ in configuration at exactly one chiral center. 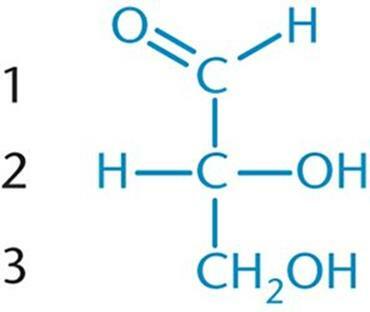 These are defined as epimers (such as D-ribose and D-arabinose, which only differ at C-2, as shown in Figure 4.7). A summary of these different types of isomers is provided in Figure 4.8, which shows four different stereoisomers of an aldotetrose, including two optical forms of erythrose and two optical forms of threose. Because D-erythrose and L-erythrose are nonsuperimposable mirror images of one another, they are enantiomers. 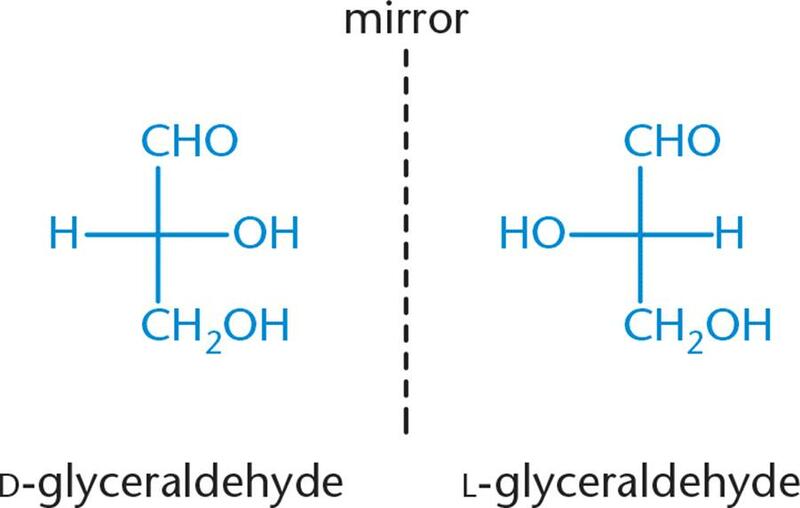 On the other hand, while D-erythrose and D-threose are not mirror images of one another, they are still nonsuperimposable, which makes them diastereomers. Similarly, L-erythrose and D-threose are diastereomers. Because they differ in configuration at only one chiral center, they can also be defined as epimers of one another. Remember, a compound can have only one enantiomer (the left hand to its right hand, or vice-versa), but may have multiple diastereomers, depending on how many (and which) chiral carbons are inverted between the two molecules. 1. Draw all of the possible D-stereoisomers of glucose in Fischer projection form. 2. Which of the diastereomers of glucose from the previous question are considered to be epimers of glucose? Enantiomers?